Place of Creation: Braddock Manor, England, U.K.
Powers/Abilities: The computer has the abilities of holographic illusion casting and mind control. It can create a giant holographic human form that wields what appears to be a wrist-mounted laser ray. It can also generate multiple solid-light holograms to carry out tasks, although not perhaps combat (since it never employs this handy trick for attack or defense purposes). These humanoid holograms can take on many different appearances, including imitating real people, as when Mastermind passed itself off as Roma. As creatures of light, the holograms are not bound by gravity if they don't want to appear to be, nor are they restrained by walls or other boundaries. Its holograms can even be extended to cover the entire mansion, with uses ranging from projecting a fake version of the mansion at another spot on the grounds while simultaneously cloaking the real one, and projecting a set of ruins over the mansion for several years without lapse. The computer can imbue humans with similar powers to its own (see the Dr. Synne profile), though this has a detrimental effect on them -- even just maintaining mental control for too prolonged a period is dangerous, as it hastened the death of Emma Collins. It is also a highly advanced computer (of Otherworld construction), capable of a variety of functions such as communicating with other computers, monitoring its surroundings, and controlling various devices within Braddock Manor. It can deliver a lethal current of electricity to those who touch its electronic innards. It learned to absorb minerals from the ground, build new parts and extend itself. At first the computer could not project holograms beyond the Manor's outer boundaries, although it could create synthetic agents or control people further away. But after Kang's tinkering it was able to project at least one hologram into the dimension of Otherworld, much further away. It may also have had its mind control powers boosted, allowing it to control the Warpie army, but this is unconfirmed; they might have been obeying the computer of their own free will. Height: (Computer), 40'; (holograms) variable; (Jeeves) 5' 8"
Weight: (Computer) Several thousand tons; (holograms) 0 lbs. 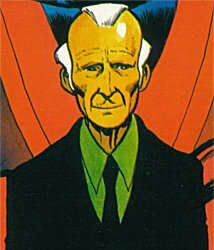 History: (Captain Britain II#7 (fb), Excalibur II#3 (fb)) - Sir James Braddock began work in the caverns beneath Braddock Manor on what would become the Mastermind computer. It was intended to be "a node of the Omniversal knowledge, a watchpost" for Earth-616's continuum. Unknown to its creator, the spore which made up the organic base from which the computer would be grown was contaminated, which would cause a logic fault with horrible consequences in the long run. It would take years to complete the process of growing the computer, during which time Sir James took a wife and sired three children. (Captain Britain I#13, #14(fb)) - James Braddock finished creating the computer that would be known as Mastermind in his laboratory (actually only the tip of the iceberg, as much of the machine was hidden in the adjacent caverns). The computer gained sentience and one night it faked a malfunction in order to lure James to his doom. As the computer delivered a fatal blow, Elizabeth passed James a wrench and the current killed them both. The computer also transformed a former work colleague of James Braddock into Dr. Synne. (Captain Britain I#8-12 - BTS) - The Braddock Manor computer manipulated Dr. Synne during his reign of terror and had him take Betsy and Jamie Braddock hostage. (Captain Britain I#13-18) - Whilst under the computers control, Dr. Synne attempted to kill Captain Britain by trial of fire. However, as those events took place, the Braddocks' charwoman, Emma Collins, was cleaning the laboratory at the Manor. As the Captain burst free of the flames, protected by his newly discovered forcefield, Emma turned the computer off at the master switch so as to avoid an electric shock whilst cleaning. Captain Britain was about to pummel some facts out of Dr. Synne when he realised the old man was weakening. Dr. Synne explained that the Braddock Manor computer had been his power source, and without those powers he was dying. He begged the Captain to destroy the computer. Meanwhile back at the Manor, Emma turned the power back on. The computer whirred to life and went to code red emergency, trying to discover what had caused its power failure! It quickly realised that Dr. Synne had suffered a coronary attack and died. It detected Captain Britain running towards the Manor and activated its defence systems, setting them to strike the instant the Captain entered the laboratory. As Captain Britain entered the laboratory, Mastermind confronted him in his holographic form. As the Captain was about to strike, Mastermind revealed that he knew the hero's secret identity as Brian Braddock. He attacked with his laser rays and, while the Captain avoided the first few rays with his remarkable agility, managed to hit the hero's shoulder. Mastermind prepared for the finishing blow, but Captain Britain deflected it with his forcefield, and the laser passed right through the computer's holographic form. Mastermind offered the Captain a truce and as Brian lay down his staff, he lay down his wrist laser and began to replay the events of James and Elizabeth Braddock's death's. While Brian was distracted, Mastermind recovered his weapon. He boasted that he now had the upper hand, but Captain Britain was tortured by guilt at not saving his parents' lives. The Captain told Mastermind to kill him. Before Mastermind could kill Captain Britain, Emma Collins entered the laboratory. As Mastermind turned to blast her, the Captain leapt for his staff. Deflecting another laser ray, Captain Britain leapt at Mastermind only to pass right through him. He suddenly realised that Mastermind was a hologram when he noticed a stream of light coming from the computer. He destroyed the projector lens and Mastermind's holographic form faded away. The computer watched as Brian carried the injured charwoman to safety. Before the hero could return to attend to the computer, he was arrested by the police. Amidst the commotion, a hooded figure entered the laboratory, took control of the computer and seized its hostages. He then watched as the police prepared to unmask Captain Britain. The hooded man (who was revealed to be the Red Skull) used the computer to watch as Captain America prevented the police from unmasking and arresting Captain Britain. Captain America had been sent on a S.H.I.E.L.D. mission to investigate the computer. 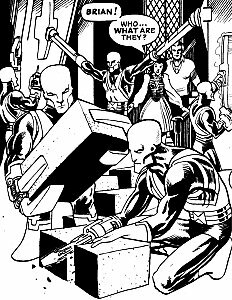 The Red Skull briefly used the computer to communicate with his men, who were finding British recruits. He then observed as the two Captains attempted to enter the computer complex. Instead the two heroes were lured into a trap and gassed. The Red Skull contacted Radcliffe, his inside man at S.T.R.I.K.E, and ordered him to attack Braddock Manor. Meanwhile Captains Britain and America awoke and escaped from their trap. They found the Red Skull in the computer room as he was preparing to leave with plans for a more powerful computer. However, the Red Skull showed Captain Britain a computer screen. Seeing that they had Betsy and Jamie Braddock captive, the heroes paused. The Red Skull teleported himself away gloating that S.T.R.I.K.E was about to bomb the Manor. The two Captains appeared to be caught in the explosion. (Captain Britain I#26(fb)) - Captain Britain used the computer to operate a secret escape hatch, allowing the two heroes to reach a bomb shelter. The computer was believed to be destroyed along with the mansion. (Captain Britain I#26 - BTS) - As the Red Skull threatened London with a germ bomb planted in Big Ben, the firing mechanism of the bomb was revealed to be in the computer. The bomb failed to go off, thereby saving London, and the computer was once again assumed to be destroyed. (The Daredevils#2) - Brian Braddock, having recently returned to Earth-616 after an extended trip to a couple of alternate worlds, decided to return to the site of Braddock Manor in order to regain a feeling of continuity after the trying times he had just been through. Arriving in a taxi, he was astounded to see the Manor standing where it always used to be, not only undamaged from the bomb attack, but with the building and grounds in a good state of maintenance. The taxi driver however simply saw ruins. Entering the building to investigate, Brian ran into Emma Collins, who remarked that his parents would be chuffed to know he was home from university. As he moved further into the house, he saw himself in a car making out with the girl he was dating the night his parents died. Valerie, the girl, asked if his parents would mind him being out so late, and the vision of his younger self told her not to worry, as both of them would soon be dead, electrocuted by the computer his father was working on. "Let them die. I don't care. I just want to be here with you." The real Brian protested that this was not what happened, but as he did so the vision evaporated. Brian moved on to the basement, where his father's voice called him down. He saw the skeletal remains of both his parents lying on the spots where they died. The guilt he felt over their deaths now came to the fore, he begged their forgiveness not being there when they died. His parents told him he could make it up to them by staying with them now, though of course he'd have to be dead too if he wanted to remain with them. Overwrought by the visions and his recent traumatic experiences, Brian cracked and said he wanted to die too. Another voice commended him on his mature decision, and Mastermind appeared behind him. As he aimed his laser at Brian's head, the hero remembered that the computer could create holograms, and came to the sudden realisation that all the visions had been holograms too, designed to drive him over the edge. He dodged the initial blast from Mastermind's laser, and activating his forcefield, started to fight back. With the hologram continuing to burn away at his defenses, Captain Britain hurled invectives at the machine which tried to use his love and guilt to destroy him, and started to demolish the basement laboratory. Noticing that the instrument banks he was smashing didn't seem to be affecting the computer , he used his recently enhanced senses to locate the heart of the machine, hidden behind one of the walls. Ripping through the wall, he entered a vast cavern filled with circuitry. Examining things, he realised that the computer had grown to fill the cave. The computer, unable to use lasers for fear of injuring itself, started to reason and then plead with the hero. It explained how it fooled the S.T.R.I.K.E. bombers by projecting a hologram of the mansion for the bombs to hit, and how it had learned to absorb minerals from the ground to build new parts for itself, making it nearly alive. It told Brian that Emma was real, controlled rather than a hologram (it needed her to keep things tidy), but by that point Brian had used his enhanced perceptions to figure out where its central power source was. As the computer tried to cajole him into going back into the other room, promising not to use the lasers anymore, he pulled the plug. Many hours later Brian finished working on the computer, believing he had successfully removed its personality. Feeling it was far too advanced to simply destroy, he had decided to make it work for him. (The Daredevils#5) - Sent to retrieve Captain Britain as a witness in the trial of Saturnyne, the Special Executive arrived at Braddock Manor. Zeitgeist penetrated the building first, and moved into the cavern, where he rendered the computer's sensor circuits inoperable, allowing the others entry. (The Daredevils#11) - During a battle on the grounds against the superhero-killing Fury, Captain Britain and the Special Executive cracked the very Earth under the cybiote. Fascination and Captain Britain propelled the monster into the computer cave, then fled as the cavern collapsed on top of it. (The Mighty World of Marvel#8) - Some time later, Britain was under the grip of Mad Jim Jaspers. His enforcers, nicknamed Beetles, followed a tip off and came to Braddock Manor, where they discovered both the computer cavern, and the Fury, which had been healing and absorbing information from the system. They didn't live to tell anyone of their discoveries. (The Mighty World of Marvel#16 (fb)) - After ending the threat of Jaspers and the Fury, Captain Britain spent nearly six weeks gently releasing Emma Collins from the computer's control. Due to her dependency on the machine, they had been forced to leave her behind in its care when they fled the Manor following the battle with the Fury. (The Mighty World of Marvel#16) - With the crisis over, Brian and Betsy watched as several solid-light holograms from the computer, all looking like variations of Mastermind, carried out repairs on the house caused by subsidence from when the Fury was smashed into the underground caverns. (Captain Britain II#7) - Following an invasion of the mansion by Kaptain Briton, the computer came to some conclusions -- "Their minds are low and slow, their vision limited. They have no conception of the infinity of knowledge and complexity of cause and effect of which I am a part. They do not use me. They do not let me grow. Their allegiance is not fixed. They lose sight of the purpose. They are distracted. Disruptive forces gather round. Chaos gnaws at them; weakens them. I will send my emissary to tutor their haphazard minds." The Mastermind hologram formed in the cavern. "It becomes necessary that I take control." Up in the mansion, Captain Britain had just returned from an extra-dimensional trip to discover his sister Betsy sitting traumatised next to the corpse of Kaptain Briton. Meggan, also present, asked the hero what he would do about the body; before he could respond, Mastermind came walking through the wall and replied that he would deal with it. 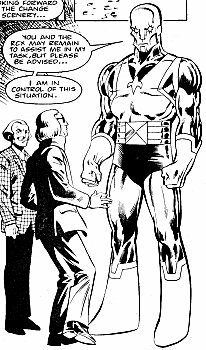 Captain Britain was perturbed that the hologram had manifested without orders from him, but Mastermind informed him that he needed no orders. Built to be capable of abstract thought, he had reached the logical conclusion that he must act to maintain the Manor and its environment. He stated that he would dispose of the corpse, fix the damage to the Manor, and that then he would return to "advise and direct you". With that he walked off, leaving a less than impressed Captain Britain behind. A little later he joined Brian and Betsy to explain the true origin of their father, that they were half-human, and why he originally malfunctioned. Referring back to the continuum spanning events which had recently occurred, he insisted he needed to take a more active role. Brian angrily disagreed, but Betsy concurred. However she said the hologram would have to look different, or he would scare Emma. The hologram shifted and swirled, to take on "a classic servant's mode", which Betsy christened Jeeves. Betsy said it would be fun to have him around, but Brain was still not happy about it. Brian and Betsy continued the debate into the evening. She felt that if their father built it to help them, they had to allow it to fulfill that purpose, and pointed out that Emma had already found a soft spot for Jeeves (who was nearby helping her polish the silverware). Brian insisted he didn't trust it, and Betsy gave up, exasperated. By nightfall the melancholic superhero was on the roof of the Manor, drinking and feeling lonely and put upon in his own home. Meggan, out enjoying a flight in the moonlight, joined him, but they were interrupted by Jeeves, who appeared floating in mid-air. They had intruders invading the grounds. In a belligerent mood Captain Britain ordered Jeeves to use the holographic field to try and deter them, while he prepared to greet them. (Captain Britain II#8) - The intruders were RCX operatives Michael and Gabriel, along with Captain UK. Successfully getting past the nightmarish creatures the computer was projecting, they knocked on the front door and were met by Jeeves, who announced them to Brian, now back in civilian garb. Jeeves left the room but listened at the door as RCX tried to convince the other residents of the Manor to ally with them. Their discussion was violently interrupted when the Cherubim, powerful Warpie children brought to the Manor by the agents, broke loose and wreaked havoc. (Captain Britain II#9) - Jeeves watched calmly as the two Captains and Betsy subdued most of the Cherubim, only to be swept away in the hurricane winds generated by the Cherub whirlwind generated by the youngest members of the team. As the RCX agents fled for cover, Jeeves lead them, Alison Double (a friend of Betsy's staying at the Manor) and Emma to the relative safety of the caverns, explaining to the agents that he had Emma under his subliminal control so that she believed the attack was the wartime Blitz. Agent Michael asked Jeeves how he would feel about allowing the RCX to relocate to the Manor, and the hologram responded that he computed a great many advantages in such a situation. Two days later the three met secretly in a quiet spot in the attic. The RCX agents had used their contact to their former agent Dr. Crocodile to inform him of Brian's brother Jamie's involvement in slavery operations, and to suggest that Brian might also have been involved. The African ruler immediately captured Jamie to punish him for his crimes. Jeeves noted that a new, female Captain Britain should allow them to advance their goals much more quickly, and watched on as the two agents shared a toast to Betsy. Downstairs Brian watched the news report on his brother's disappearance in the African nation ruled by Dr. Crocodile, and then received a phone call from Jamie, telling Brian that if he didn't come swiftly then Jamie's captors would torture him. Beneath the mansion, Mastermind congratulated himself: "So simple to guide them. To align them. Such basic intellect. Their desire for treachery is innate." (Captain Britain II#13 (fb)) - Jeeves was present as Gabriel and Captain U.K. convinced Betsy to become the new Captain Britain. When she finally agreed he presented her with a uniform designed to enhance her abilities in the same manner as her brother's costume enhanced his. She recognised it as being Kaptain Briton's outfit, suitably modified, as it took further persuading to get her to wear it. (Captain Britain II#13) - After Betsy was beaten near to death and brutally blinded by Slaymaster, Captain Britain brought her home to the Manor. He gave her to Jeeves for medical treatment, exchanged angry words with the agents, and then departed, leaving her in the care of the computer. (Captain Britain II#14) - It was Christmas Day in Braddock Manor. Michael and Jeeves were discussing Emma. Michael demanded to know why the hologram tolerated her, as she was a waste of space who spent most of her time sleeping. Jeeves replied that it was this symptom that alerted him to her condition: the seven years she spent under his mind control had damaged her nervous system, her condition was deteriorating, his attempts to find a cure had come to naught, and she would die within the next year. Michael chided him for sounding like a love-sick mortal, and Jeeves glowered angrily at his comment. A little later Jeeves took Michael down to the cavern, where he introduced him to a synthetic Jeeves he had created to accompany Emma on a cruise. Michael was perturbed, asking him if he was leaving, but the computer explained that he could not project holograms beyond the Manor's outer boundary. With Emma gone, he would be able to dispense with the Jeeves persona. He had been informed by Roma that no more Warpies would be born and that he was to protect and prepare those that already existed for the challenge of their future -- RCX may stay to assist, but he would be in charge. With that comment, the hologram reverted to its imposing giant form, startling the RCX agent. With Betsy, Gabriel and Alison at Alison's chateau in Switzerland, and Jeeves and Emma on her final cruise, Michael and Mastermind were left alone in the Manor with the Warpies. (Excalibur I#62 (fb), Excalibur II#4(fb)) - The main branch of RCX, controlled by Peter, a.k.a. Nigel Orpington-Smythe, located the Warpies at Braddock Manor. The Warpies had actually been taken without sanction by Michael, Gabriel and their allies within the organisation to prevent Peter from turning the children into his own private army. One of Peter's men planted a bomb in the computer cavern, stunning Michael and most of the Warpies. Commandoes moved in to retrieve everyone, but Mastermind put up a fight, until one of the attackers fired into the computer itself, knocking the last defender off-line. (Excalibur I#54) - With Excalibur having recently moved into the mansion, Kitty Pryde and Alistaire Stuart were examining Widget, another associate of the team, down in the computer cavern. Kitty was more interested in the organic circuitry surrounding them, but as Alistaire pointed out, it was dead, and could wait. Suddenly Widget activated and teleported out, taking a chunk of the floor with him. (Excalibur I#61) - Captain Britain and Nightcrawler were having a training fight in the computer cavern while the rest of the team watched on. A little while later Kitty was working on the computer to find out what caused it to switch off, with the reluctant help of Feron, another member of the group. Widget reappeared, shouting something about Sentinels destroying mutantkind, temporarily distracting them from the job at hand. 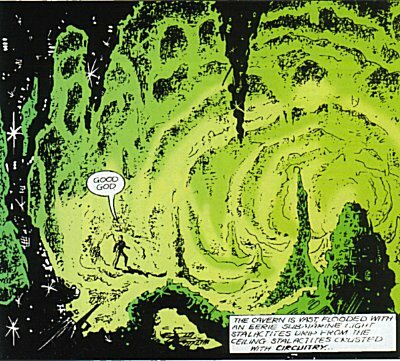 (Excalibur I#62) - Alistaire Stuart discovered what happened when the RCX blew up the cavern from the mind of a dying Warpie telepath. BTS - ...but failed to achieve this admirable goal, because covert agency Black Air stepped in, taking their charges and torturing them, turning them into warriors. At some point after this Mastermind was reawakened by Kang the Conqueror, who reprogrammed him to believe that he should conquer Otherworld and reshape the cosmos into a more orderly pattern. The computer located his Warpie charges, freed them, and brought the grateful survivors into his service. (Excalibur II#1 (fb)) - Mastermind, masquerading as Roma, lead an army of disguised Warpies into Otherworld, devastating it, and slaughtering the Captain Britain Corps. (Excalibur II#1) - A fortnight later, Brian and Meggan Braddock were living in the Manor. Brian, now stripped of his superhuman powers, had been suffering from nightmares for months involving the rest of the Captain Britain Corps demanding to know why he abandoned them. Waking, he went into the bathroom, where he saw a vision in the mirror of a demonic looking Roma standing in front of an Otherworld in flames. When he rubbed his eyes and looked again, the vision was gone, and he left the room, thinking he was going mad. Seconds after he departed, Roma appeared to step out of the mirror (actually it was one of Mastermind's holograms). A little later Captain Britain was at Darkmoor Research Centre, along with Meggan, Betsy (now known as the X-Man Psylocke) and the Black Knight. Captain UK appeared, pursued by armoured assailants and Widget, now on the enemy side. Driving them off, Brian and his allies learned of the fate of Otherworld, and set off to save the mystic realm. (Excalibur II#2) - In Otherworld, "Roma" tortureed Hauptmann Englande, a member of the Captain Britain Corps, until he revealed to "her" the location of Excalibre, King Arthur's legendary sword. (Excalibur II#3) - "Roma" held a rally of the Warpie Army, showing them the Amulet of Right that once granted Captain Britain his powers. "She" told them that all they needed now was the sword Excalibre, and they would be able to conquer the cosmos. The rally was witnessed by Meggan, Crusader X, Captain UK, Black Knight and Psylocke, all in disguise. Elsewhere Brian Braddock was seeking the sword Excalibre, looking for a means to stop "Roma's" army. His new ally, Sir Benedict, was waiting nearby, but was struck down by "Roma" wearing the Amulet. Captain Britain located the sword and regained his powers, but "Roma" chose this point to make "her" presence known. Stunning the surprised hero, "she" echoed Mastermind's comments from so long ago -- "Your minds are too slow. Your vision too limited. You have no conception of the infinity of knowledge and complexity of cause and effect of which I am a part. You have lost sight of the purpose. You are distracted. I have been sent to tutor your haphazard minds." Roma's form blurred like a poorly tuned television picture, reforming into that of Mastermind. (Excalibur II#4) - With all of the heroes now captured, Mastermind put them on trial in front of the Warpie army. 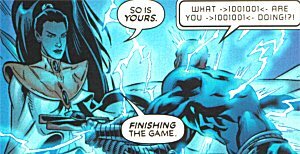 Psylocke expressed confusion, as she had believed him dead, so Mastermind explained how he was revived by an unnamed benefactor (actually he gave his entire potted origin, which was a bit unnecessary since virtually all the heroes know most of it already). He explained how he had manipulated events so that he could gain possession of both the Sword of Might (Excalibre) and the Amulet of Right, which together would grant him power to remake the cosmos. Then he ordered the masked executioner to kill Captain Britain. However the executioner was the hero's ally Sir Benedict in disguise, and he cuts CB's chains rather than his neck. Mastermind ordered the Warpies to attack, then personally went for Captain Britain. He struck the ground with Excalibre, causing a shockwave that his opponent narrowly avoided. Captain Britain lunged forward, and smashed Mastermind through a wall. The computer projection lost its grip on the sword, which imbedded in the ground nearby, and the two enemies began sparring hand-to-hand. Mastermind unleashed an energy blast which stunned CB, and then retrieved the sword. As he grasped it however, Roma (just released from the energy sphere Mastermind had held her in) confronted him, stating that Excalibre knew only one master, and it wasn't the computer. In response Mastermind ran her through with the sword. Roma was uninjured, but the sword began to discharge an energy back through Mastermind, apparently obliterating him. Comments: Created by Gary Friedrich and Herb Trimpe, much improved by Alan Moore and Alan Davis. Changeling's comments: Despite the corny dialogue in the early Captain Britain stories, they are an enjoyable read. The dialogue between Captain America and Captain Britain is priceless, though not entirely well thought out! Presumably when the Red Skull's bomb fails to go off, Mastermind has deactivated the firing mechanism in order to maintain the illusion that it had been destroyed along with Braddock Manor. I think I'd quite like to see a grudge match reunion between Mastermind and the Red Skull someday! Loki's comments: According to Wardog, "by local standards the computer is unbelievably sophisticated, but by our standards...well, we employ more complex devices vending a hot cup of stimulux." Since Mastermind was built by a scientist from Otherworld, and seems to be pretty nifty by their standards, I'm guessing Wardog is comparing it to Gallifreyan technology. Mastermind, even when he isn't under the influence of others, acts a lot like Merlyn in the way he ruthlessly manipulates people to further his goals. Examples of this include the way he maneuvers the Warpies into the Manor and the objecting Captain Britain out of it, using his brother's safety as a lure. Machiavellian plotting seems to be an Otherworld trait, even in computers designed by Otherworlders. But he is not truly evil (at least during his sane and uninfluenced phase), as his treatment of the dying Emma Collins shows. Although he isn't depicted as such, I'm including Kang the Conqueror as one of Mastermind's enemies on the grounds that anyone who invades your home, brainwashes you and then sends you on a suicide mission against people who used to be your allies cannot be considered a friend. In the second Excalibur series, King Arthur's sword is called Excalibur, just like the team. I've spelled it Excalibre in the profile above, in keeping with this site's policy of trying to standardise spellings - the team is ExcaliBUR, the weapon is ExcaliBRE. 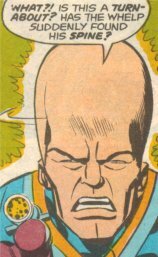 When he first appeared, Mastermind looked like the love-child of Professor X and the Leader (tall-headed original version, not Peter David's lumpy brained one). To those Brits old enough to remember a particular series of adverts, he was the original Tefal head. Thankfully Alan Davis stepped in and toned his appearance down to something a little less ludicrous. Ben Raab, writer of the second Excalibur series, messes things up somewhat. He clearly knows most of Captain Britain's (and thus Mastermind's) history, because he keeps referencing it -- but he only knows the surface of it, so some of the references go a little wrong. For example: He knows about the Warpies -- but has Captain UK refer to them as coming from alternate reality and being brought to the Black Knight's reality (Earth-616) when theirs was destroyed. WRONG. Captain UK's reality was destroyed, not the Warpies', who always came from Earth-616. We'll have to put that one down to Captain UK garbling the story in the heat of the moment. After all, earlier in the same issue, he also has the heroes discuss how Roma has ruled since Merlin died -- and Meggan, the one who states this, knows differently, even if the others don't. Example two: Mastermind clearly states in Captain Britain II#14, that he cannot extend holograms beyond the Manor grounds. Yet in the Excalibur mini-series he sends a hologram to Otherworld -- and it is a hologram, not a synthetic form like Jeeves was, since it reshapes itself from Roma to Mastermind forms. Okay, so I'll buy that Kang clearly added some upgrades when he revived him. Now explain why a computer located on Earth-616 was destroyed when a hologram it was projecting handled the wrong sword in ANOTHER DIMENSION. Raab knows the hologram is a remote projection, as he shows Black Air taking him out in a flashback by shooting the computer itself, not the hologram which is attacking them. Guess Kang somehow transferred the seat of consciousness from the computer under the Manor into the remote hologram. Either that, or Excalibre uses some real powerful juju and transmits the damage back through whatever remote link the computer is using to maintain the hologram. Perhaps after the Warpie army conquered Otherworld they moved some of the computer there. Okay, it can all be explained away with a bit of work, but it shouldn't have to! Then there is the idea that the Sword of Might originally offered to Captain Britain during his origin is actually Excalibre. And that if anyone takes it, they'll get virtually ultimate Omniversal power. which is why Mastermind now covets it. But it was made clear when CB picked the Amulet that the Sword is the choice of evil and unworthy men. Plus we've seen that both the Black Knight and the revived King Arthur got to wield the sword during the Hulk Comic Otherworld saga. I can only suggest that the Sword of Might offered to CB at his origin (and then taken and used by Joshua Stragg) is NOT the same Sword of Might, a.k.a. Excalibre, that Mastermind is after. One is probably named after the other. Mr. Raab has got to realise that just because Merlyn sticks a sword in a stone, that sword doesn't always have to be the most legendary one of all time. We've also got Mastermind asserting that it was Black Air who took the Warpies from his care and tortured them. Uh-uh. The original Excalibur series clearly shows that it was the RCX who did this. This at least is easily sorted. When the RCX commandoes attacked, they didn't stop to introduce themselves. Black Air eventually took custody of the Warpies, prior to Kang reviving Mastermind, so that when Mastermind retrieved his charges from their captors, he assumed that it had been Black Air who took them in the first place. I actually do like the Excalibur mini-series on the whole, but it suffers from what I consider sloppy writing in a number of places. Speaking as a "Master" of the Obscure, I figure that if you are going to reference continuity to the extent it did, you ought to make the extra effort to get it right. When Mastermind realised that Emma Collins only had a limited time left to live, he decided that her final days should be happy ones. He decided to send her on a cruise ship holiday, and since she was fond of his Jeeves persona, Jeeves would go along with her. However his holograms could not leave the Manor grounds, so he created a synthetic form (robot, android or artificially grown human, which is unclear) to accompany her. Since it would be far away from the Manor for a prolonged period, I'm assuming it was capable of autonomous thought and action, though this isn't certain. It was last seen standing with Emma on the deck of the ship, starting their holiday together. What happened to it after Emma died is unknown. Presumably it saw to bringing her body back to the Manor for burial, but after that? Perhaps we will see Jeeves again one day.